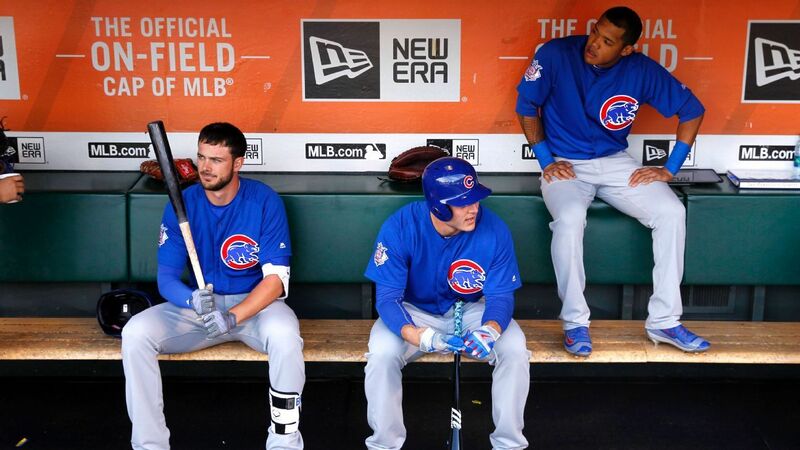 10:29 AM ETprintcommentThe Chicago Cubs remain consensus World Series favorites heading into the final 2Â½ months of the regular season.The Cubs are 7-2 to win the World Series at multiple Las Vegas sportsbooks. The Washington Nationals, San Francisco Giants and upstart Cleveland Indians are next at around 6-1, followed by the Texas Rangers (10-1) and Baltimore Orioles (12-1).The Westgate Las Vegas SuperBook presents the most up-to-date odds for the 2016 World Series.With half a season of information, Dave Tuley gives out three more value bets for teams to win the 2016 World Series. Kansas City remains appealing at 60-1.How is your favorite baseball team doing this season? Joe Peta breaks down the best and worst of the first half, along with projections for all 30 teams for the second half.2 RelatedThe Toronto Blue Jays, Boston Red Sox and Houston Astros also are in the playoff mix, with odds of better than 15-1.The Cubs (53-35) have attracted by far the most bets to win the World Series at Station Casinos' and Boyd Gaming's sportsbooks. They have a seven-game lead over the St. Louis Cardinals in the National League Central. "The Cubs also have drawn the most money, nearly double the nearest team, which for us would be the Giants," Bob Scucci, director of race and sports for Boyd Gaming, told ESPN.The NL West-leading Giants (57-33) are the most popular World Series bet at William Hill, which runs several shops in northern Nevada, closer to the San Francisco area. The Giants have attracted more bets and more money than any other team at William Hill. The Cubs are a close second.The Rangers (54-36) were the best bet in baseball before the All-Star break. Bettors waging $100 on Texas in every game to this point would be up $2,494, according to sports betting database BetLabSports on SportsInsights. The largest World Series bet William Hill has taken to this point was $25,000 on the Rangers at 15-1. The bet was placed Dec. 7 and would win $375,000. "The Cubs, Giants, Rangers combo has been bad [for us]," Nick Bogdanovich, William Hill director of trading, said in a text message.The Cubs are favorites in Las Vegas to win the World Series, and slugger Kris Bryant (left) is favored to win the NL MVP at 2-1 at the Westgate SuperBook.Â Cary Edmondson/USA TODAY SportsThe Tampa Bay Rays (34-54) were the worst bet in baseball before the break. Bettors waging $100 on the Rays in every game have lost $2,094. The Rays are 17.5 games back in the AL East, not good for the bettor who put a $5,000 on Tampa Bay to win the World Series at 60-1 in late January at William Hill. The Rays are now 1,000-1 at some shops.Cubs third baseman Kris Bryant is the favorite to win the NL MVP at 2-1 at the Westgate SuperBook. Colorado Rockies third baseman Nolan Arenado is the second choice at 7-2. Orioles shortstop Manny Machado and Astros second baseman Jose Altuve are co-favorites to win the AL MVP at 4-1.Los Angeles Dodgers ace Clayton Kershaw is the favorite to win the NL Cy Young Award. He is 3-1 at the Westgate SuperBook. Madison Bumgarner and Johnny Cueto, the Giants' pair of aces, are the second favorites at 7-2. Chicago White Sox starter Chris Sale is an outright favorite (10-11) to win the AL Cy Young Award.Overall, baseball bettors have fared well so far this season. "It's been a struggle and streaky season," Jay Kornegay, Westgate vice president of race and sports, told ESPN. "[We've been] on the short end of things more often than we would prefer. "Boyd Gaming's Scucci characterized the baseball season as "very choppy" for his shop. "It started off great, but quickly faded in May," Scucci said in an email. "May and June were terrible months for us compared to prior years."